In a recent article about Michigan driver’s license restoration, I took up the issue of ignition interlock violations and how to avoid them. Because the ignition interlock and problems with it are such a fundamental aspect of license appeals, I’m going to keep up the posts on this subject, and stay on a roll. In this installment, we’ll shift our focus from the idea of an interlock “violation” and instead look at the very common situation where a person goes through his or her first year with the device without being notified of a problem but then, at his or her next hearing to remove the interlock and restore full driving privileges, has to explain an incident, like a positive breath test during that preceding year, that did not result in any formal violation, but still shows up on his or her final interlock report. In other words, simply not being violated during your time on the interlock does NOT mean you’ll have smooth sailing when you go for your full license thereafter. There are lots of reasons why you may have something like a positive breath test beyond the actual consumption of an alcoholic beverage, and an exploration of those goes beyond the scope of this article. The kicker comes when you have not taken a drink but still wind up with a positive breath test, or even a start-up failure. In fact, the Michigan Secretary of State’s Administrative Hearing Section (now called the AHS, and until very recently known as the DAAD) allows 3 of these start up failures in any download period before it formally violates you and re-revokes your license. The technical term for a “re-revocation” of your license is the “reinstatement of original action.” As I noted above, however, even though you don’t receive an actual violation, you’re going to have to explain every single incident or problem you’ve had on the interlock, including each and every positive breath test. The whole world of interlock installation, monitoring, use and violations is evolving, and quickly, at that. In other words, things are different today than they were even last year, much less 2 years ago. This is primarily, if not entirely, because of the Secretary of State. 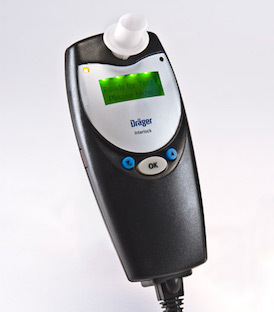 Interlock companies have to react quickly to changes in the stare’s rules regarding ignition interlock units, as well as the application and interpretation of those rules by the Secretary of State. Interlock companies tend to be like major brands of TV sets: They’re all pretty similar, and they essentially all do the same thing, but there is always one brand that seems to be the “best.” Years ago, before flat panel TV’s were the norm, Sony was always the best. Now, in the world of high definition, Samsung is king. In the world of ignition interlock companies, I cannot say enough good things about Nationwide Interlock. Owned by Dr. Herb Gilbert, Nationwide works hard to meet the needs of its customers. Dr. Gilbert has been known to give his personal cellphone to customers so they can call him for help if they need it. Rather than a passive, reactive approach, Herb Gilbert is active in all things interlock, following and providing input on everything from license restoration cases, contemplated, pending and new legislation, all the way to how local Detroit-area Courts, including Sobriety Courts, use the devices in DUI and High BAC cases. His tireless work has driven Nationwide to the head of the pack of ignition interlock providers. 1.) Dan the driver is about to leave for work one morning, and for some reason (maybe something he ate, or mouthwash used too soon (even though one should be very careful about that) before he tried to start the car) his car won’t start because he blows a .28. A minute or so later, he fails again, blowing a .29. Already late for work, Dan gets his wife to drive him in her car, and doesn’t do anything with his interlock until he starts his car without incident the next morning. 3.) Careful Carl also has the same start-up failure. Once he gets his car started, however, he drives directly to the police station, getting a PBT about 20 minutes after the initial failure. He’s dreadfully late to work, but at least he can prove that he was the one who provided the negative breath test samples. 4.) Paula the planner has the identical start-up failure as our the other 3 drivers, but she sticks with her car, gets it started and eventually provides clean (.000) breath samples, as well. Because she has the interlock unit with the camera, she doesn’t need to go to the police station (some police stations don’t give these tests, and almost all that do charge at least $10) or follow up with an EtG test later. Her interlock download will show, literally, that she was the person who provided each breath sample. 1.) Dan the driver may be denied his full license because of his failed test and lack of a retest until the next day. For everything he can say, his numbers look just like a guy who was drinking the night before, tried to time it, and then failed. It looks for all the world like Dan knew he wouldn’t be able to pass another breath test anytime soon because alcohol that has been consumed has to metabolize, whereas “mouth alcohol,” like the stuff from mouthwash, dissipates rather quickly. 2.) Sober Sarah will have a hard time, as well, because the Secretary of State will ask for proof that she provided the subsequent clean breath samples. When Sarah tries to point out that the event log of her tests is consistent with her everyday trip to and from work, and as one hearing officer likes to point out, the burden is on her to prove it, and the hearing officer cannot assume anything. 3.) Careful Carl will be just fine. Even if he couldn’t find a police station for his PBT, a timely (as in within a day) EtG test will clear him and take care of any doubts. 4.) Paula the planner won’t have a worry in the world either, because she will have the same proof as Carl, without the hassle of having to go and get it. If there is a real culprit here, it’s normal laziness. None of us are so ambitious that we want to learn all the nuances of stuff we might never use. I’ve had 2 versions of the iPhone now, and between them, my smart TV and my technology-loaded car, I probably don’t know 25% of what these things can do, if that. Once an interlock unit is installed and you get the car started, and then keep it running by passing rolling retests, it’s easy to forget that trouble can happen even though you never drink. Anyone can be lulled into a false sense of security, thinking that because he or she does not consume alcohol, there is nothing to worry about. That, however, is entirely wrong. You have to read every page of the order granting your restricted license; it contains a notice regarding proper interlock use. You have to read the manual for your interlock and be ready for trouble when you least expect it, because that’s probably when it will come. As good as any lawyer may be, he or she can only work with the available evidence. Given the importance of knowing what to do when things don’t go smoothly, it should be a priority to know exactly what to do when (and not if) that happens. Things like Nationwide Interlock’s instructional card attached to the unit’s handset are a huge step in that direction. If you’re facing an interlock violation, another part of your job is to do your homework as you look for a lawyer. I’m normally pretty diplomatic about things, but here, you’re making a huge mistake if you go in and try and do this alone. Whatever you do, make sure you hire a lawyer who handles interlock violations all the time. I handle them just about weekly, and I have honestly handled more than I can count. It’s important to ask any lawyer you’re considering just how many interlock violation cases he or she has handled overall, and how many recently. A lawyer who has done 1 case per year for 3 years can say he or she handles them “regularly.” Regularly is not frequently, and here, experience counts; more is better, and less is not. As you call around, make sure you contact my office to see how I analyze your case. I do all my consultations over the phone, right when you call. We’re open M-F, from 8:30 to 5, and can be reached directly at 586-465-1980.